It all begins with a pause. It begins by allowing yourself to be present in your body. By giving yourself the time and space to relax and reconnect with your Self. To let go of the distractions. To step into your Truth. To embrace your power and light. beautiful Sound Sanctuary, located in Santa Monica, CA or virtually via Zoom. Should you prefer a private session on demand in the comfort of your own home, please submit an inquiry for pricing and availability. Open the door to new perspectives, healing, and clarity. Embrace your power and the flow of life. You are ready! The world needs your light, and now is your time to shine. Work closely with me to experience total transformation as you reimagine, rebuild, and create healthy new patterns in your life. In addition to recharging yourself on an energetic level, you will heal body, mind, and spirit as you learn to let go of anxiety, addictions, pain, struggle and fear. Perfect for a birthday party, corporate event, or intimate get together with friends. Group sound baths offer a community healing experience in which all guests leave feeling restored, relaxed, and connected. This sacred meditation circle is an intimate space for group transformation. It serves as a vessel for those who are interested in healing and elevating their consciousness to come together with the intention to connect, relax, manifest, and transform. Please submit the form below to RSVP and the address will be provided to you. "My Reiki session with Susy was so special. Susy has such a gentle presence and made me feel so safe to be completely myself through the process. We talked about what I was working through and what my intention for the session would be before we began. Her space is so cozy, I immediately dropped right in. The energy healing was powerful and we began with breathwork, which she gently guided me through making me feel safe and able to release. She even did some sound therapy around blocked areas in my body that needed extra attention. I felt so recharged, calm and at ease after our session together. Susy gave me recommendations on crystal therapy and we pulled an intention card to end my session. It was a really deep, spiritual experience and I am so thankful to know Susy as a healer. She has powerful gifts and is so kind and gentle. " "In Susy’s delicately decorated space in Santa Monica her private sessions are also a blast!! She focuses on your individual experiences and needs, and custom designs powerful, unforgettable sessions. She combines sound healing and reiki and crystals as needed for each session. Her loving, compassionate and warm approach will invite you to naturally relax into the sessions with little or no resistance and lead you to finish in an absolute refreshing coma state! Over the past 6 months, our weekly sessions have been totally inspiring, transformative, enlightening, and fulfilling!!" " I left my first Sound Bath/ Reiki session with Susy feeling restored. I felt energized, at PEACE and more connected to my body. I was grieving the loss of a friend and following our session I felt an immediate sense of hope and relief. In the words of Maya Angelou, "Ive learned that people will forget what you said, people will forget what you did, but people will never forget how you made them feel." I felt confident that Susy's expertise in energy healing, her kind heart and the magical experience that she created was fully authentic and I will never forget how much better this experience made me feel." "I cannot thank Susy enough for the meditation she did for my bridal party and me before my wedding ceremony. There was so much intense energy, albeit excited energy, and all I wanted was to ground myself and experience the moment with as much peace and clarity as possible. Susy made that wish come true! From the moment the meditation came to an end, I felt an out-of-body weightless, calm, and confidence. Our relationship through the ups and downs of life has made me a more patient and kind person and she has taught me to let life unfold as it should. For her to witness that lesson come to fruition and be there to support me on my wedding day was a gift I will cherish forever! " Lie back, relax, and experience a whole new type of bliss. Before long, you’ll find yourself in slipping into a deep state of meditation and relaxation as your tension and stress melts away. Based on ancient healing techniques, vibrations of sound work on a cellular level to recalibrate the mind, body, and spirit. These healing frequencies stimulate alpha and theta brain wave frequencies, balance the hemispheres of the brain, and promote deep rest and relaxation. 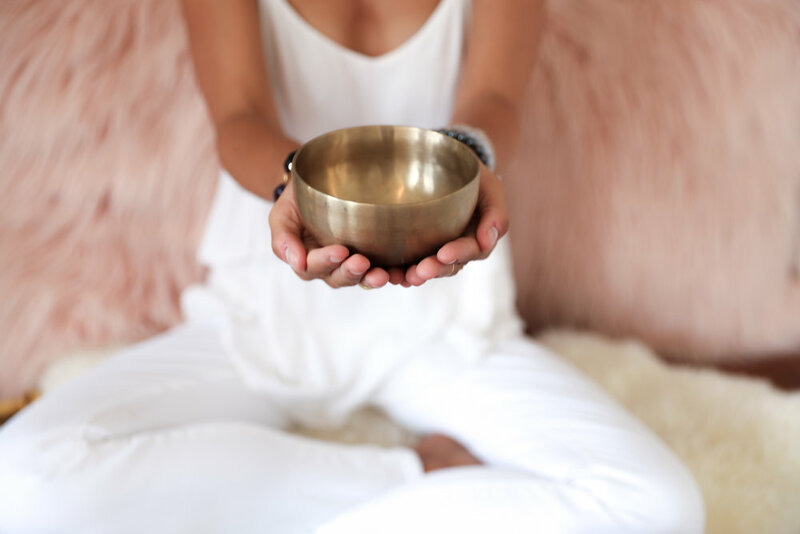 In addition to relief from chronic pain and migraines, benefits of a Sound Bath include improved sleep, reduction of stress and anxiety, as well as a renewed sense of well-being, calm, and happiness. A Sound Bath is like a deep tissue massage for your body, mind and spirit. Reiki (pronounced ray-key) is a Japanese technique for stress reduction and relaxation that also promotes healing. Reiki energy is administered through gentle touch and activates the natural healing processes of the body to restore physical and emotional well-being. It is based on the concept that an unseen "life force energy" flows through us and gives us life and vitality. A reiki treatment feels like a wonderful glowing radiance is flowing through and around you as it relaxes and balances the body, mind, and spirit. This holistic modality treats the whole person and creates many beneficial effects that include relaxation and feelings of peace, security and wellbeing. Many have reported miraculous results. Reiki is a simple, natural and safe method of spiritual healing and self-improvement. Proven benefits of meditation include stress reduction, improved concentration, enhanced productivity, chronic pain reduction, better sleep, sustainable energy levels, emotional balance, increased immunity, improved metabolism and more. You will learn several methods and techniques that will enable you to tap into the sense of calm that exists deep inside your mind (whether you believe it is in there or not). No matter how busy, anxious or restless you may be, we’ll work together to create a personalized mindfulness ritual. Whether you are new to meditation or looking to deepen your existing practice, we can help. Yoga means union. So much more than just a physical practice, yoga is a way of life. Using a combination of breath, sound, philosophy, and physical posture, we’ll create a therapeutic yoga experience that speaks to your soul. You’ll learn to step into your power, find your grace, and connect with your Self. This practice is designed to elevate your recovery and sense of well-being by bringing your body, mind, and spirit into a state of joy, balance and ease. Learn to experience peace and contentment on and off the mat.